La Confianza Hotel Lunahuana (Bungalows y Cabañas) | Una colección de acogedores bungalows/cabañas ecológicas construidas dentro del viñedo de lo que fuese la antigua bodega La Confianza – Lunahuana. In times when the singing of the birds was the only sound that dominated the valley, a magical hummingbird with crystal wings tired of wandering around, flew over the Cañete river valley looking for a place to live. Immearsed in the harmonious and peaceful nature of Lunahuaná, found a hidden place where the sun merged with the murmur of the river and perched between the hills, an old Pisco winery with charming corners filled with legends and stories. 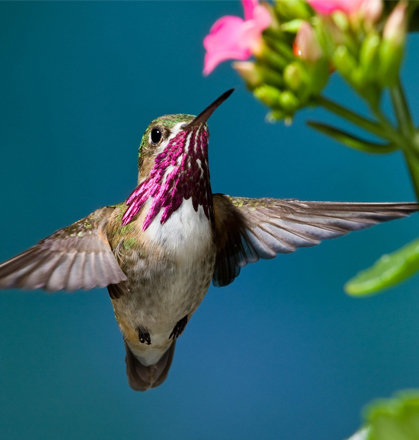 The hummingbird chose to make this place its home, today known as Hotel La Confianza, a corner of paradise made of peace and nature. La Confianza Hotel is a collection of cozy ecological cabins built within a vineyard of what used to be La Confianza Winery. La Confianza, a 100 year-old wine cellar, was first built in 1908. Parts of the original design have been conserved till today, such as the arched facade and main hall, which functioned as the central production environment and has been converted into a rustic bar. From the sources of the river that are born in the mystery of the mountains, we have obtained the most fresh trouts and shrimps of the whole valley, to offer them to you as main dishes in our Menu, thus emerging the majesty of flavors that awaken the pleasure of a moment that will last forever in your memory. From the gentleness of our intense sun and the fertile lands we are surrounded by, we owe the freshness of the meats and vegetables that give life to the dishes we serve, always in line with the great food Peruvian tradition and adding new local flavors that, complementing our environment, allow us to offer you an spectacular experience at La Confianza. To achieve a more complete experience, full of adventures, surrounded by the natural wonders of Lunahuaná; we recommend you choosing these unique and truly amazing activities that you can experience in the areas next to the hotel. We suggest visiting the most attractive sites to achieve a true connection with nature, a promise offered by La Confianza. On the road to Lunahuaná is worthy you leave your cell phone aside and appreciate the beautiful lanscape. The closer you get to Catapalla, the more connected with nature you will feel and the more disconnected from routine. The vegetation, the grape crops, the rurality of the houses and the sound of the river, let you know that you are reaching the place you were looking for. Sun all year and privileged by the landscapes and the wonder of the river that runs through the whole place, Lunahuaná is the ideal option for those who seek to get closer to nature, learn about history and appreciate the antiquity, just two and a half hours from Lima . 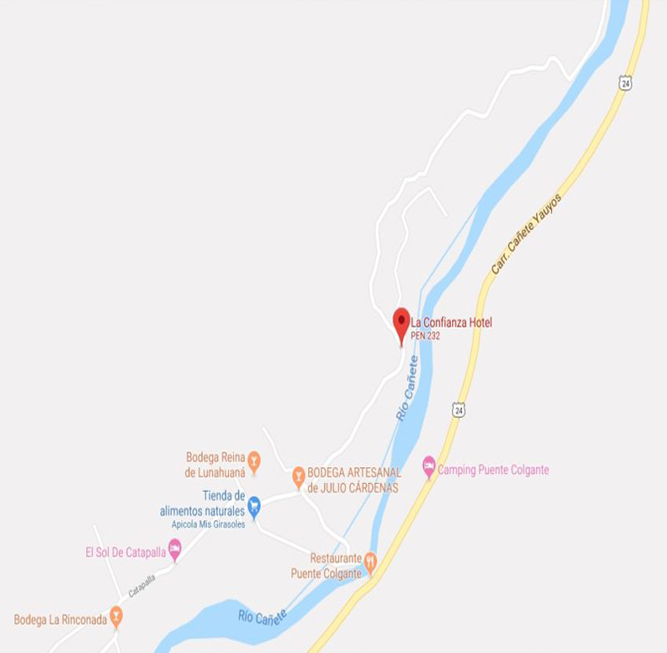 La Confianza is perfectly located in the middle of the countryside and nature, in the valley of the Cañete river, in the district of Lunahuana, 15 minutes from the Plaza de armas and on the way to the national landscape reserve Nor Yauyos-Cochas (Huancaya) . La Confianza has a unique view throughout the valley, at the same time that you discover the mysteries that hide the hills of the Sierra de Yauyo. It is an ecological space, away from the technology, routine, and stress of the city. If what you are looking for is to disconnect from reality and eliminate the stress that this causes, this is the ideal place.